I received product for review from Prime Time Toys. The opinions within this post are of my own and I was not influenced in any way. Please do your own research before purchasing products or using services. Your opinions and results may differ. I have two teenage boys who, although nearly grown, are still kids at heart from time to time. For instance, the Battle Blaster from Prime Time Toys has gotten plenty of play time since I received it for review. Other than having to warn the boys not to aim the blaster at each other, it's turned out pretty well. 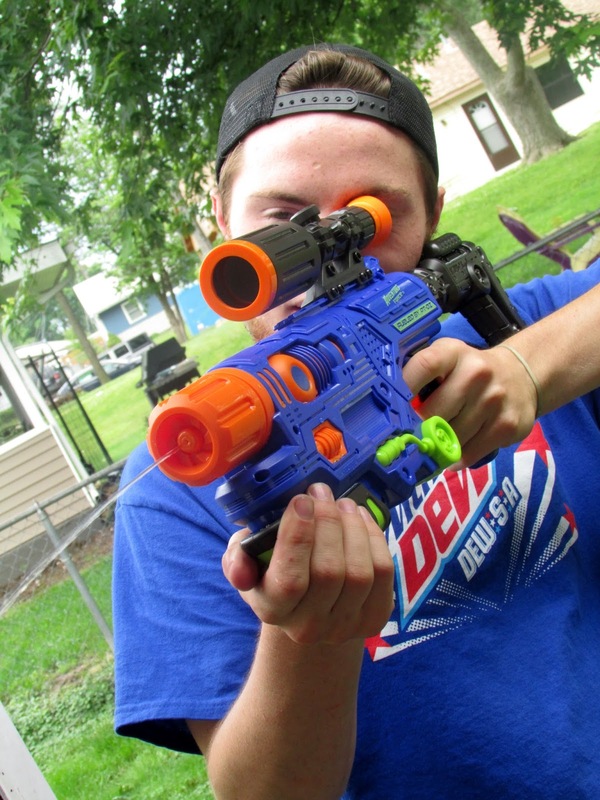 The Battle Blaster Power-Pump Water Gun performs with great precision aided by a detachable scope. With a water blast range of up to 35', you'll be sure to catch your target in the crosshairs. Trust me, I know; I've been in those crosshairs! The water gun is packaged in a cardboard box and secured with zip ties, so scissors are necessary to cut the gun loose. We did have a hard time, at first, finding the cap opening for the water. There wasn't any indication on the box. After feeling around for a while, we were able to locate it. The gun holds a good amount of water and it's easy to operate. You just have to pump the bottom half of the barrel and pull the trigger to squirt. The water comes out in a long, thin stream. If you prefer not to have the scope on top of the gun, you can detach it by sliding it off. 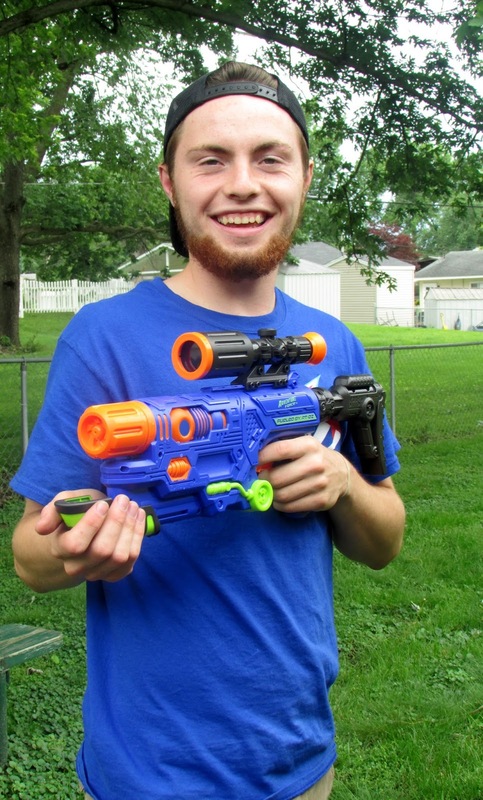 The Battle Blaster Power-Pump Water Gun has gotten plenty of use and has proven to be a fun outdoor activity. Prime Time Toys launched the new collection of water blasters, including the Battle Blaster, in January of this year. They are available exclusively at Wal-Mart and walmart.com. The Adventure Force™ line of water blasters will bring a splash of fun to the backyard this Spring and Summer. 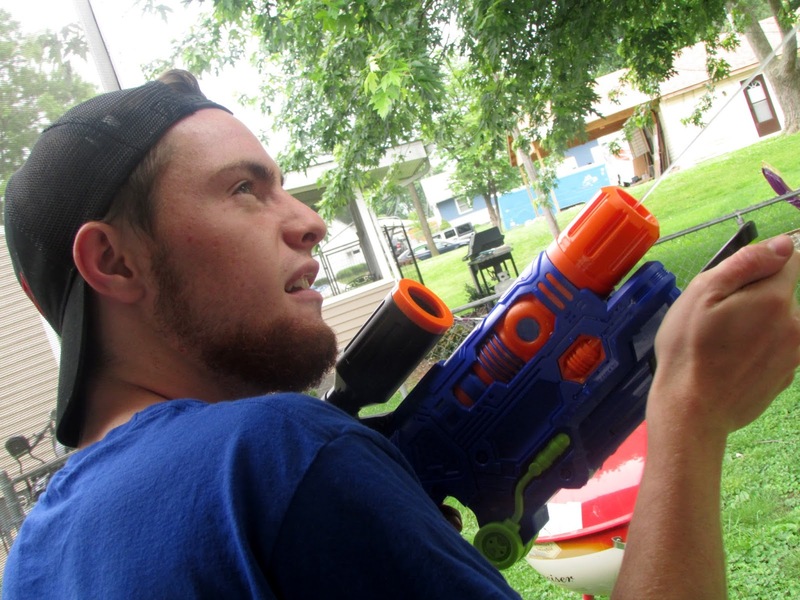 One person will win a Battle Blaster Power-Pump Water Gun. I like the SUNKEN TREASURE. That will be fun to play with. The HYDRO ROCKET SPLASH BLASTER would be another fun one. I like the Hurricane Water Balls!! I like the Sunken Treasure pool game. I like the Original Skydiver. My boys would also like Water Blasters. They love any toys like this. They had a water gun fight with their cousins yesterday. The dart blasters are pretty cool! Thank you! My grandson would like the Hydro Rocket Splash Blaster. I like the Scorpion Gatling Blaster. I also like their Splash Sports Pack. I would love the crossbow. My daughter would love the hydro blaster pro. Anything she can get her dad and older brothers with is really liked. I also like the ELIMINATOR water blaster! I like the 'sunken treasure chest' pool toy. Their G-Rip Vortex Spin Copter looks like a lot of fun. My grandson would love playing with that! Prime Time Toys has some really cool water toys! I like the Monster Blaster that has the head of an alligator. The kids would love it! The Airhawk Compound Bow looks like lots of fun! I would love to get our kiddos the LEGENDFIRE ™ POWERSHOT BLASTER! The boys like the SCORPION BLASTER. I also like the Talon Dart Blaster. My kids would also really enjoy the Water Blasters! My daughter would love the Powerbolt Belt Blaster! Looks like lots of fun! My grandson would love the Eagle Dart Bow. I like their monster blaster! I like the DIZZY DIVE RINGS FUN PACK. I would love to get the AIRHAWK COMPOUND BOW for my son, I think he would love it. The Hydro Rocket Splash Blaster looks like a lot of fun! CRITTER BLASTER™ would be fun this swim season. My boys would LOVE to have the SCORPION BLASTER -- awesome! I like their SUNKEN TREASURE pool toy! I like the Sunken Treasure game. I also like the Hydro Rocket Splash Blaster! I'd love to get the HYDRO ROCKET SPLASH BLASTER for my grandson. He'd love it! I like the shark monster blaster! Scorpion Gatling Blaster would be a top pick. My nephews would have a big time with those Splash Bomb pool toys, lol. They love stuff like that. My sons would love all of them! I want to get them the Hydro Rocket Splash Blaster. The Hydro Rocket Splash Blaster looks like so much fun! I likee the Hydroblaster Pro! The scorpion blaster looks like a ton of fun for my sons. i want to get The Hydro Rocket Splash Blaster. it looks like it will be a lot of fun. The monster blaster is fun. The Big Jump Launcher looks fun. I know my son would love it. I like the enforcer belt blaster. I'd like to get the Super Sharpedo for my grand son ! The Max Liquidator is very cool. I'd love to the able to blast my grandkids with this toy! My son would love the dart blasters. My son would love the Battle Blaster...another one he would love is the Hydro Blaster. Water guns are so much fun...I may have to attack him with it! :-) Thank you. My kids would love the MONSTER BLASTER Water Blasters! They look like so much fun! I love the monster blasters. Thanks for the chance. Would love to add this to our water arsenal. I like the EAGLE DART BOW, it seems like a fun toy. I like the monster blaster. The Eagle Dart Bow would be fun to play with my nephews. I like the sunken treasure pool toy. I like the Original Sky Diver. I like the water blasters they are so much fun in the pool! Lots of fun toys I like the Dart Bow! I would pick the Splash Sports Pack. i also really like the water blasters. I like the Sunken Treasure toy, very cute!